Cubanet, Ana Leon, Havana, 3 March 2017 – Jose Vargas is 85 years old and a retired musician. He lives alone in a room in a tenement in Old Havana, depending on a monthly check of 240 Cuban pesos (eight dollars U.S.) and whatever help his neighbors can offer. For two years this old man has waited for cataract surgery in both eyes. He was “given the run around” without the least consideration at the League Against Blindness; at Dependent Hospital, the operating room ceiling collapsed, causing the indefinite postponement of the surgery; and at Calixto Garcia Hospital there were no doctors available. In spite of Vargas’ ordeal, the official press speaks with pride of the aging population that today comprises 18% of the Cuban population. It argues that this longevity is an achievement of the socialist system and optimistically describes it as a “challenge” for the near future. But at the current juncture, the free health benefits that the Island’s high officials preach so much about in front of international agencies are not perceived. How can you plan to confront the “challenge” if a helpless old man has to wait two years for a cataract operation? Disabled by partial blindness and diabetes, Vargas began to experience hunger. He suffered hypoglycemia more than once from not eating for long hours. Rosa, 68 years old, is the only neighbor who, in accordance with her means, has dealt with feeding him and washing his clothes. “It hurt me to see him so dirty and hungry (…) I have seen him eating things that are not good for an old diabetic,” the lady told CubaNet. Nevertheless, Rosa could not take on that responsibility for long given that she herself is retired and has health problems; so she tried to seek help. Rosa explained Vargas’ case to Old Havana’s Municipal Government and sought a food quota and social worker services from the Family Attention Centers. Reluctantly, they gave her written authorization that would permit Vargas to carry home, twice a day, a bowl with rice, peas, scrambled eggs and jam; all poorly made and without the necessary caloric content. As if that were not enough, Vargas had to walk a kilometer a day or pay 30 Cuban pesos (a fifth of his pension) for a bicycle-taxi in order to collect the food. The social worker who should have taken care of this task never showed up. 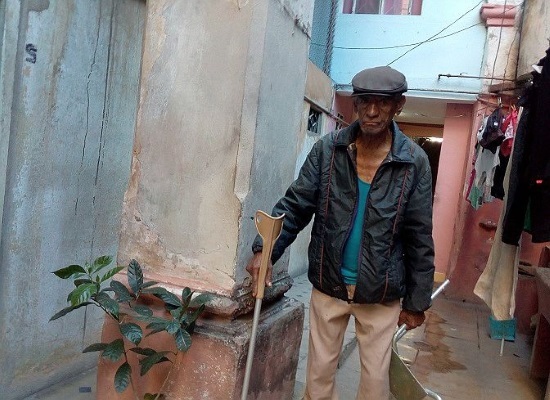 Behind the suffering of a forsaken old man there is so much administrative corruption and human sordidness that right now the prospect of growing old in Cuba is terrifying. The State does not have the institutions or the specialists equipped to confront the wave of aging that is approaching. The old age shelters – with a couple of exceptions – are worse and do not accept old people with dementia, advanced Alzheimer’s or any other illness that requires care around the clock. At the beginning of the century Fidel Castro dedicated many resources to graduating thousands of social workers who only served to squander public funds in that crazy “Summer on Wheels” campaign, where the same young people charged with regulating fuel consumption in order to protect State property wound up stealing it. The government spent millions of pesos, awarded college degrees to a gang of delinquents and today cannot even harvest the humanitarian benefit of the investment planned on the basis of political volunteerism and a lack of common sense. In Cuba today there are not enough social workers, geriatric specialists, adequate food or medicines. Many unfortunate old people live in dwellings that are in a deplorable state. Vargas himself is in constant risk of slipping on the mold caused by leaks in the tenement’s cistern; or being killed by a piece of loose brick from the eaves and balconies of the building whose century-old structure is in an advanced state of deterioration. In the face of official indifference, people who don’t have a place to live enter “the mansion” in an old folks’ home, to be “cared” for in exchange for staying with the living instead of the dead. While death approaches, who complains of mistreatment? Who can say if the old person accepts his new situation or is feeling threatened? A country that does not concern itself with old adults leaves them to the mercy of bad people. That is the future that awaits Cuba, given that the State wants to subsidize everything, and it is not possible. Families have fragmented because of the exiles, and not even the Church can be counted on. It is no wonder that the number of suicides by elderly people has increased, although the government hides the statistics.